Dr. David E. Guggenheim is a marine scientist, conservation policy specialist, ocean explorer, submarine pilot and educator. He is the founder and president of the Washington, DC-based 501(c)(3) nonprofit organization, Ocean Doctor, dedicated to advancing the conservation of the world’s oceans through scientific research, education and community engagement. 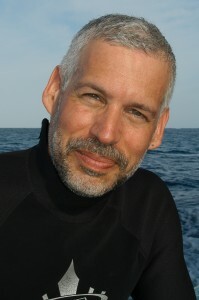 Guggenheim created and oversees Cuba Conservancy – an Ocean Doctor Program, and is in his 18th year leading collaborative research and conservation efforts in Cuba focused on advancing economically- and environmentally-sustainable solutions for coastal communities that protect and sustain coral reef ecosystems. After more than 50 years without diplomatic relations, Ocean Doctor’s current project with Cuba’s National Center for Protected Areas represents the first official project between Cuba’s environmental ministry and a U.S. entity since the normalization of relations between the two countries. As an ocean explorer, Guggenheim piloted the first manned submersible dive into the world’s largest underwater canyons in the Bering Sea as a scientific advisor to Greenpeace. He was inducted into the Explorers Club as a National Fellow in 2008. Following the wreck of the Maltese freighter, Oliva and resulting catastrophic oil spill at Nightingale Island, part of the most remote inhabited archipelago in the world, Dr. Guggenheim has been leading efforts in the U.S. to assist in the protection of the remaining population of endangered Northern Rockhopper penguins. Sixty five percent of the world’s population resides in those islands. His 2013 documentary, Disaster at Nightingale, details the Oliva spill in the South Atlantic that killed thousands of penguins. Guggenheim is working to advance cutting-edge technologies for sustainable aquaculture practices to the Americas to reduce pressure on overfished wild fish stocks. Following the tragic BP Deepwater Horizon Gulf of Mexico oil spill, Dr. Guggenheim has led efforts on a key recovery project in New Orleans East, the Viet Village Urban Farm Sustainable Aquaculture Park, a next-generation fish farming facility designed to grow fish sustainably while taking pressure off of the Gulf of Mexico ecosystem during its long recovery. The project is designed to bring green jobs and economic benefits to the largely Vietnamese community of New Orleans East, a community that has been heavily dependent on fishing but has been seriously impacted by both Hurricane Katrina and the BP oil spill. Guggenheim maintains a strong commitment to environmental education and is currently engaged in Ocean Doctor’s 50 Years – 50 States – 50 Speeches Expedition to all fifty U.S. states, visiting schools and bringing special programs about ocean exploration and conservation to young students. So far he has traveled more than 40,000 miles, visited 22 states, the District of Columbia, 1 U.S. territory, and has made more than 100 speeches and reached more than 21,000 students in schools ranging from the northernmost community in North America, Barrow, Alaska, to Macksville, Kansas, close to the geographic center of the lower 48 states, to the U.S. Virgin Islands. Guggenheim played a lead role in forming the Gulf of Mexico Alliance, a partnership among the U.S. Gulf states and 13 federal agencies and Mexico. He also led the formation of the Trinational Initiative for Marine Science & Conservation in the Gulf of Mexico & Western Caribbean, a major project to elevate collaboration in marine science and conservation among Cuba, Mexico and the U.S. to a new level. Guggenheim hosted The Ocean Doctor Radio Show and ExpeditionCasts podcast series and plays a key role in public outreach and education about the oceans. He makes frequent speaking and television and radio appearances, having appeared on 60 Minutes, Good Morning America, CNN, MSNBC, PBS Newshour and NPR. Guggenheim previously served as Vice President at The Ocean Conservancy, President & CEO of The Conservancy of Southwest Florida, co-chair of the Everglades Coalition and president of the Friends of Channel Islands National Park.